A semi-timely post coinciding with the live-action Cinderella, which we watched as well! Unfortunately, we didn’t do any recipes from the live-action Cinderella…although the sweets that were shown at the ball were tempting. 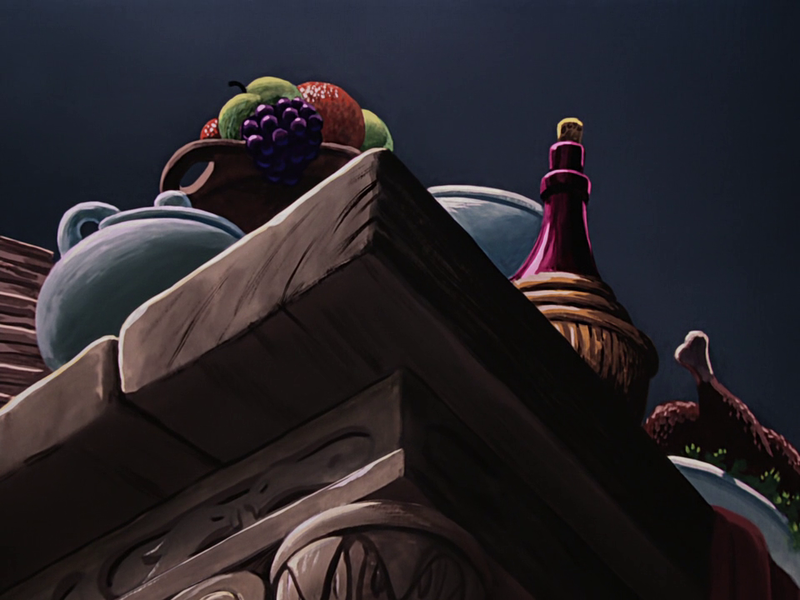 The animated Cinderella is a perfect breakfast movie, as all the food in the movie is breakfast food. So get that fire going, brush some cinders on your face and discover all the food from Cinderella. 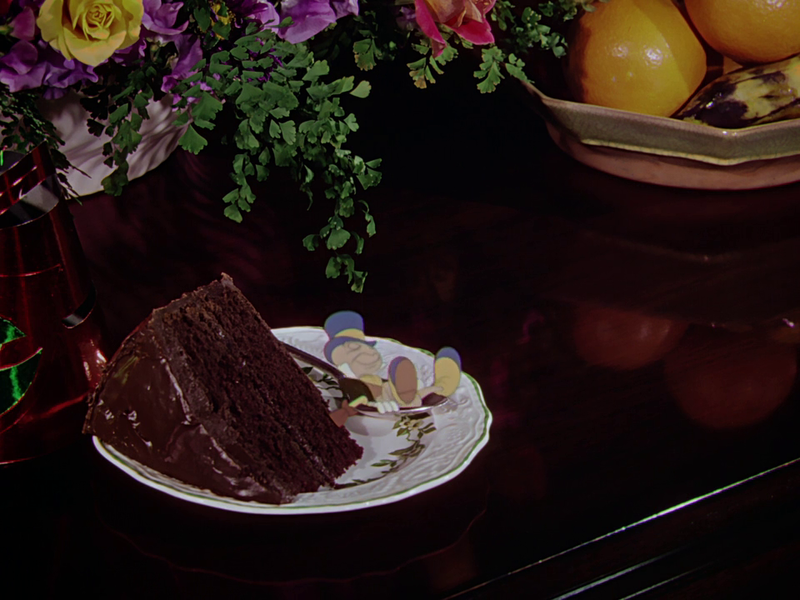 Of course Lucifer gets the first food of the movie. And on the subject of Lucifer, who would unironically name their cat after Satan? 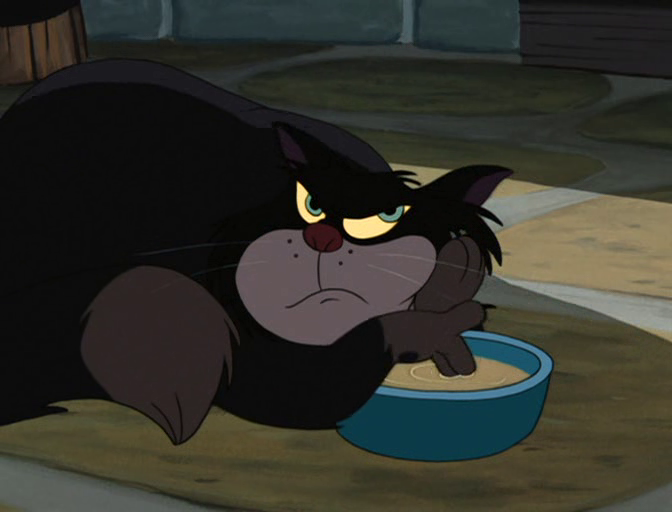 Why would Cinderella’s dad marry someone who unironically named their cat after the devil? Wouldn’t that raise some red flags? It’s not exactly subtle. Mix well for 2-3 minutes. Are the chicken feed corn kernels really worth it? Are they Gus?!?! I ate some corn, like Gus. I didn’t have to run away from a hungry cat while doing it though. 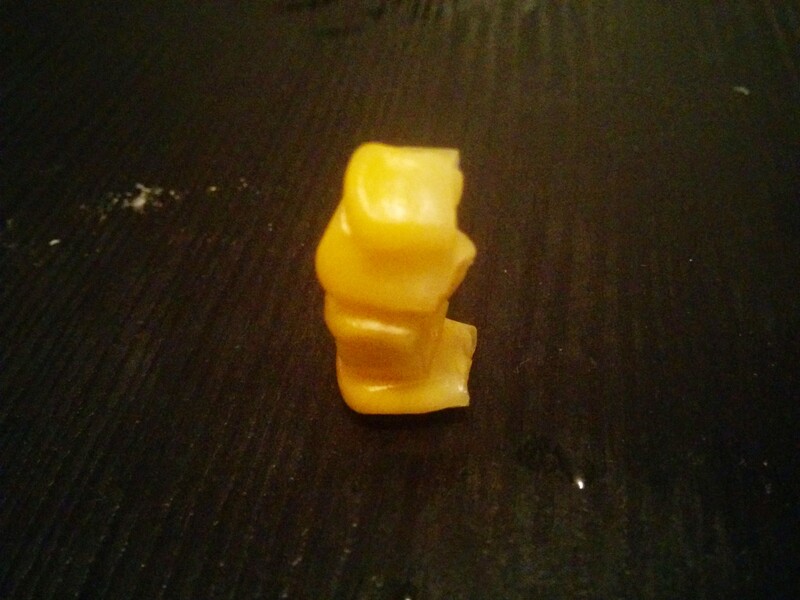 There’s not really a recipe for this, just corn. You can steam it until it’s soft. Or let it go stale and eat it as chicken feed. 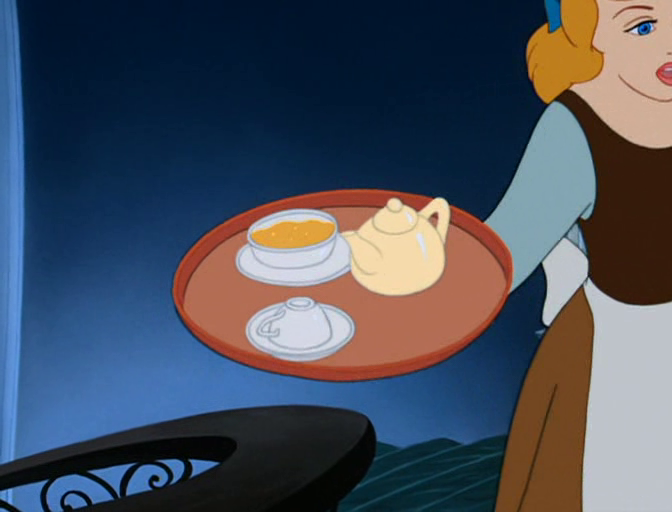 Cinderella is shown taking some breakfast to her step-family. We wanted to be accurate with the type of breakfast she would be serving, seeing as this is supposed to take place in 19th-century France. 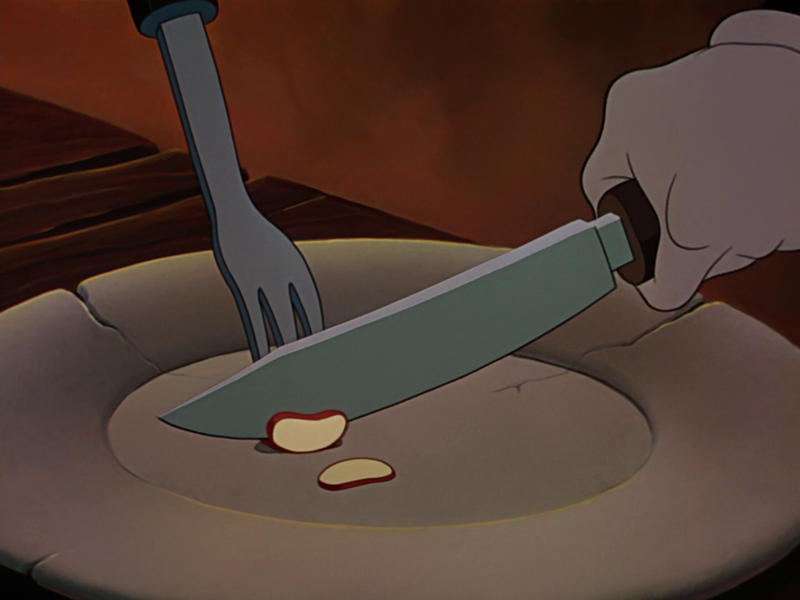 However, it seems like the animators either didn’t see it as taking place in France, or just weren’t accurate with their French breakfasts. 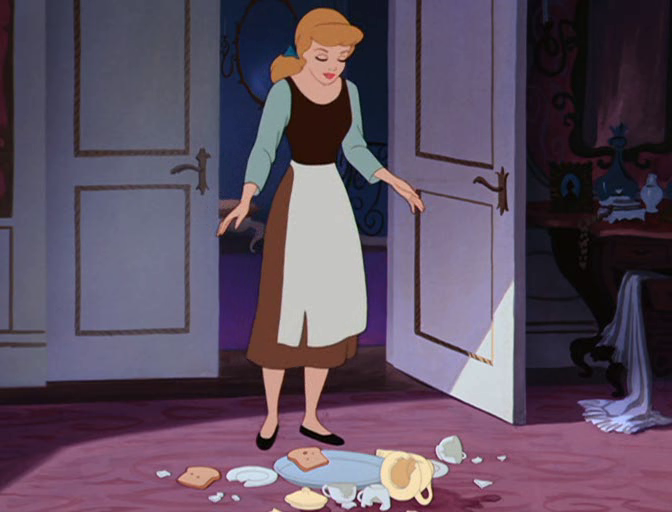 It looks like Cinderella is taking her family porridge and tea. 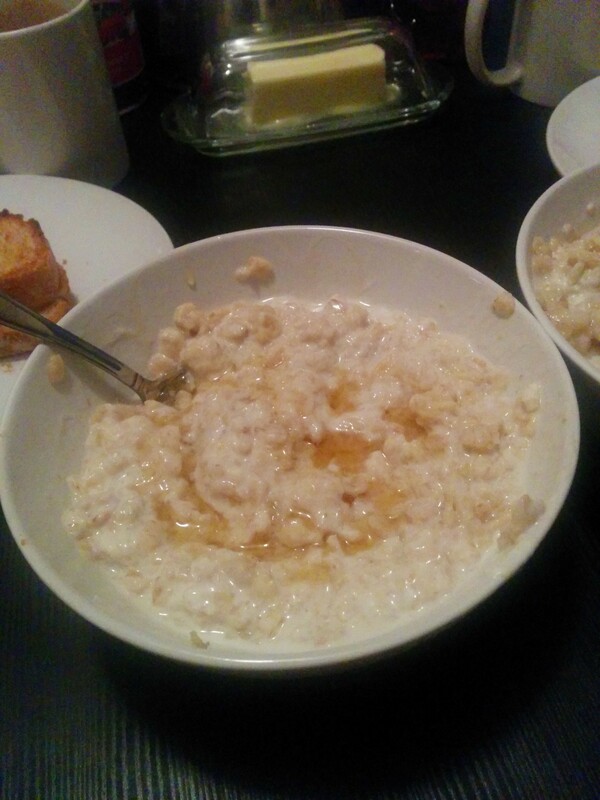 However, porridge isn’t a common French breakfast. They usually eat grains, coffee, and fruits. 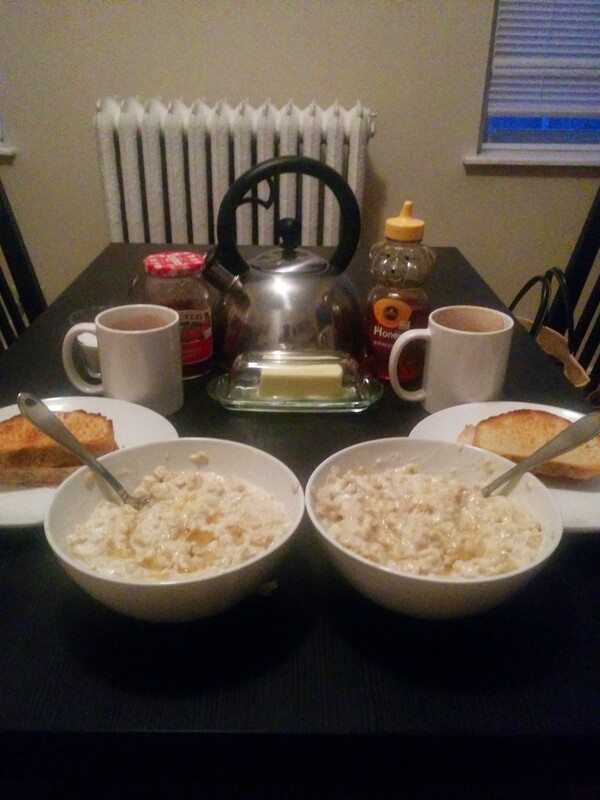 But because it really looks like porridge, we were true to the animation and made some porridge. Put the oats in a saucepan, pour in the milk or water and sprinkle in a pinch of salt.
. Leave to stand for 2 minutes before eating. To serve. Pour into bowls, spoon yogurt on top and drizzle with honey. This is more accurate to France. 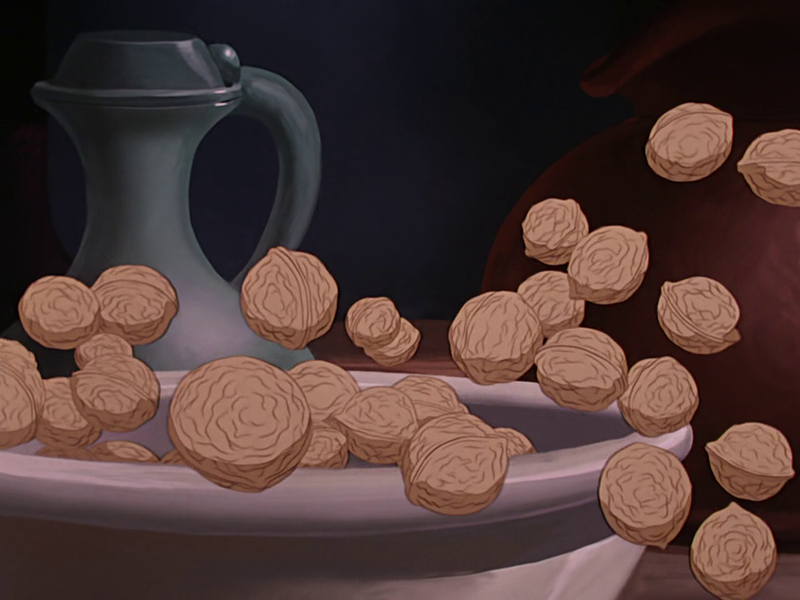 Toward’s the end of the movie, Cinderella brings her step-family breakfast yet again. This time it’s toast. We didn’t want to just buy some bread at the store and toast it, we make our own bread from scratch. Put 1/4 cup of bread flour on your clean counter top and reserve. Place remaining 3 3/4 cups bread flour in your mixer bowl. Spoon the yeast on one side of the bowl, and the salt on the other side. Pour in the warm water and with your regular mixer paddle, mix on low speed until the dough comes together in a mass. Switch to the dough hook. Mix on medium speed for 2 minutes. Dough should clear the sides but stick to the bottom. If it is too sticky, add 1 tablespoon of flour at a time. If too dry, add 1 tablespoon of water to dough to adjust. Take the dough out and place on the counter. Remember that 1/4 cup of flour that we reserved? We’ll use it now. As you knead the dough by hand, incorporate more flour as you need. Knead by hand until the dough is very satiny, smooth, tight and formed into a nice, compact ball. Turn dough over so that all sides have a thin coating of oil. Cover with plastic wrap and set in warm place for 1 1/2 hours to let rest and rise. Dough should almost double in size. While the dough is rising, about 1 hour into the rising stage, preheat your oven to 450F and place your pizza stone, inverted baking sheet or covered cast iron pot into the oven to heat up. If you are using a loaf pan for steam, also place that into the oven, on the very bottom rack, off to one side of the oven. After the dough has risen fully, punch dough down and form back into a ball. Poke your finger on the surface – the dough should give into the pressure and slowly creep back up. Pick up the dough – stretch it out until it forms a big rectangle. Dust your work surface with flour and fold over the ends of the dough inwards in 3rds. Now do a little “karate chop” lengthwise down the middle of the bread and stretch out the long ends again. Fold over in half. The karate chop helps get the middle tucked inside. Pinch all sides shut. This is important – you want to make sure that all ends including the short ends are pinched tightly to create a seal. This allows the bread to rise & expand up and out evenly. If the bread looks a little lopsided, you can try to fix it by letting it rest 5 minutes and gently stretching it out again. Just don’t knead the dough again – you’ll pop all the beautiful gas that took 1.5 hours to create! Turn the bread over so that it is seam side down. Cover the loaf with a damp kitchen towel. Repeat with the other dough ball. Leave the loaves to rest on your well-floured pizza peel or cutting board for 30 minutes. After bread is done rising, take a sharp paring knife and make 3-4 shallow, diagonal slashes on the surface of the loaf. This allows the steam in the bread to escape so that it expands evenly during the baking process. When you are ready to bake, remove your baking vessel from oven. Carefully slide the gorgeous loaf into or onto your baking vessel. If you are using pizza stone or inverted baking sheet: You can probably fit both loaves on it at the same time, just leave at least 6-8″ of space between the loaves. -> Get a 1/2 cup of water ready next to the stove. Open the stove, put your bread in the oven and throw the water on the oven floor or in the pre-heated loaf pan. Immediately close the oven door. This creates your steam. -> Bake 20-25 minutes. Check temperature of the bread – internal temperature should read 190-200F. Remove and let cool before cutting into it. If you are using a long cast-iron pot or covered baker: -> Before closing the lid on your pot/baker, put 1/4 cup of water directly in the pot. Cover immediately. Put pot in oven. -> Bake 10 minutes. Remove lid of pot. Bake another 14 minutes. Check temperature of the bread – internal should be 190-200F. Remove and let cool before cutting into it. To re-crisp the crust, put in 375F oven for 5 minutes. Cut the bread and toast it! It seems like she just has hot water in her tea kettle. But we didn’t feel like making tea. 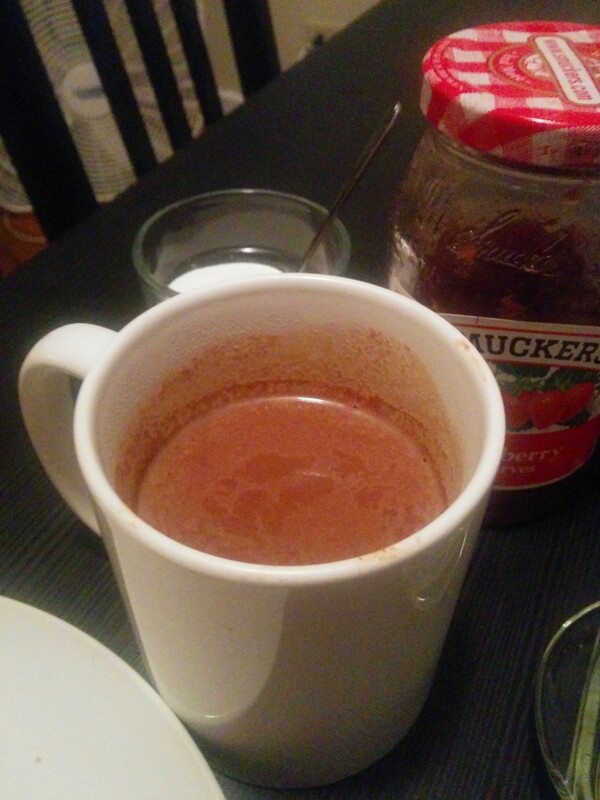 So even though it probably wasn’t hot chocolate, we found a great recipe for 19th century hot chocolate. Remember, sweet chocolate didn’t come to be until later. Scrape fine one square of Baker’s chocolate (which will be an ounce). Put it in a pint of boiling water and milk, mixed in equal parts. Boil ten minutes, and during this time mill it or whip it with a Dover egg-whip (one with a wheel), which will make it foam beautifully. Sweeten to the taste, at table. Is it a dream/a wish your heart makes? Everything was alright. Nothing was blow-your-glass-slippers-off amazing. 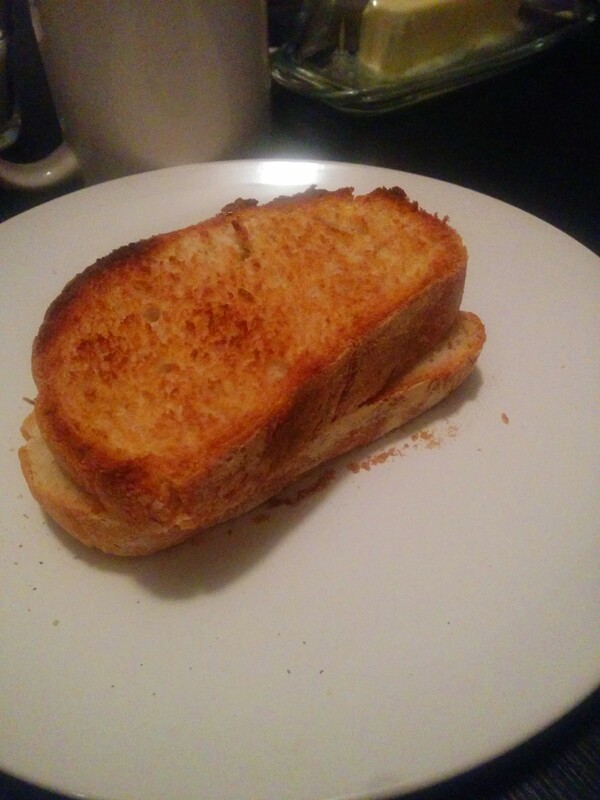 The best thing about the meal was the homemade toast. That was really good. The hot chocolate was kind of disappointing. Of course, I don’t love bitter chocolate, and it was pretty bitter. 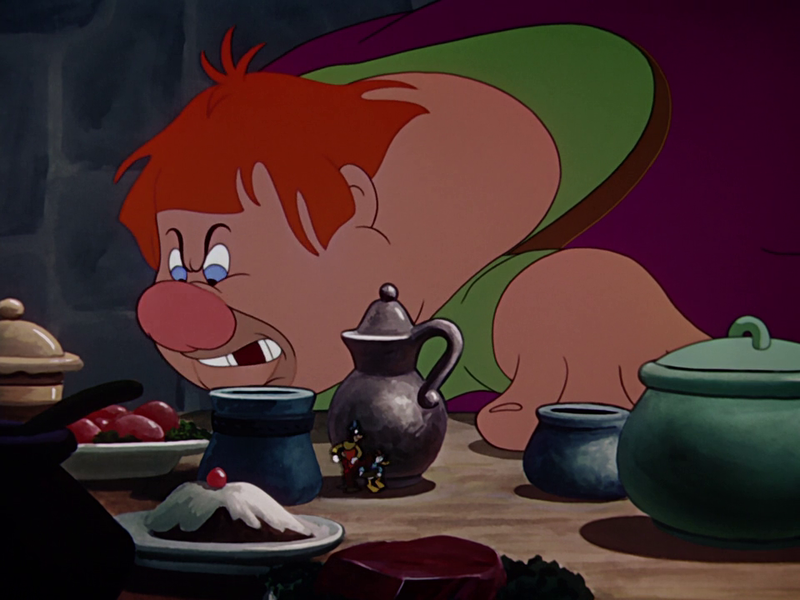 “Fe-Fi-Fo-Fum I smell the blood of an anthropomorphic rodent!” – Willie the Giant (paraphrasing…kinda). I had not seen either of these movies, but I had seen the short of Mickey and the Beanstalk included as part of Fun and Fancy Free. I hadn’t seen the other short film that was part of Fun and Fancy Free, Bongo the Bear. 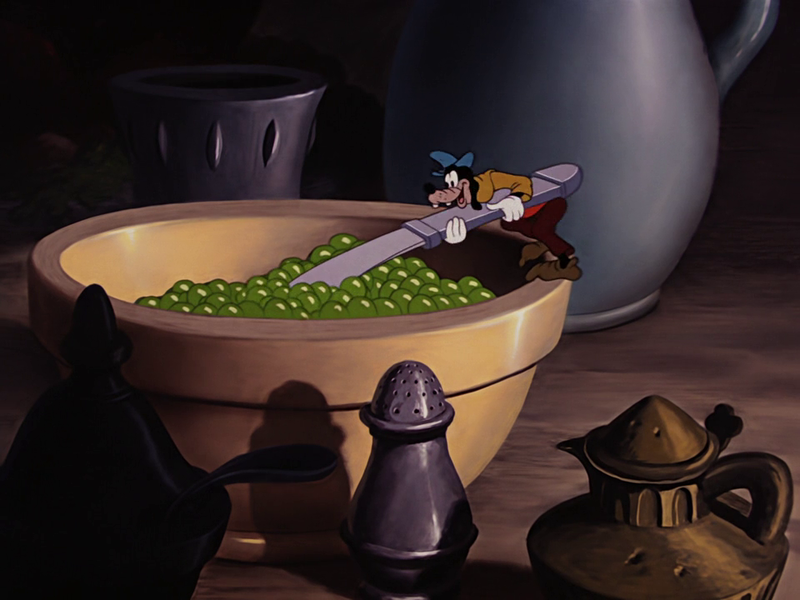 That was enjoyable, though, not as fun as Mickey and the Beanstalk. Make Mine Music was kind of like Fantasia, but with more jazzy and contemporary songs. It was quite enjoyable. It make me want to boogie. It also included Peter and the Wolf. I used to watch that short ALL THE TIME when I was a kid. I absolutely loved it. Too bad it didn’t have any food to cook in it. Make Mine Music is set up kinda like Fantasia. It is a series of animations set to music. 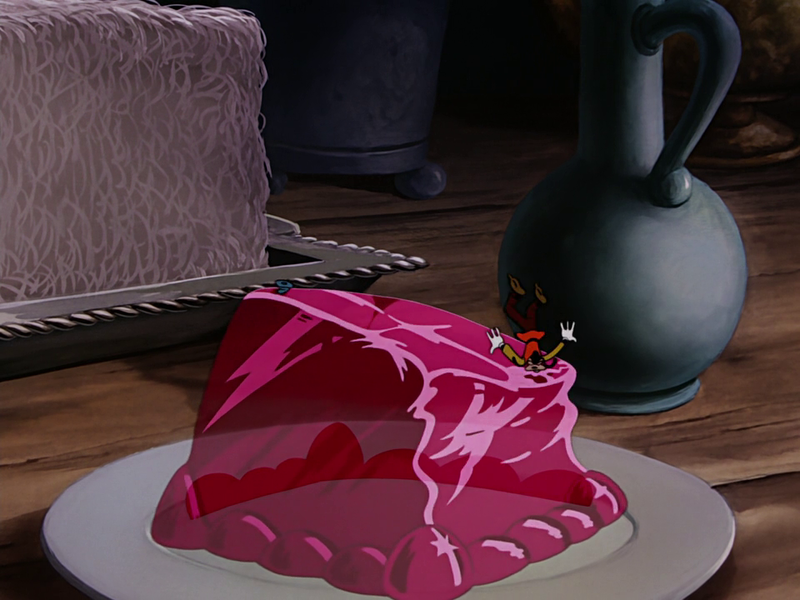 The only food shown in the whole movie comes from my favorite section of the movie called All the Cats Join in. The animation is happening as a pencil draws all of it, set to jazzy music. Some kids go into a Malt Shoppe and get some ice cream. I wish Malt Shoppes were popular when I was in high school, that would have been groovy. 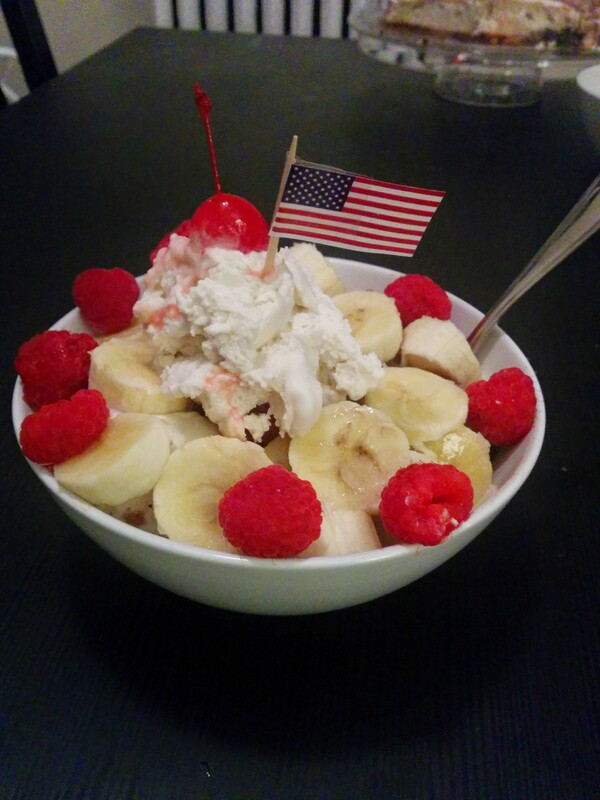 Anyway, the “bartender” starts serving up a great big ice cream boat for a bunch of the cool cats to eat. It makes it pretty easy to see what is going into the ice cream. And luckily, I didn’t have to buy a bunch of different tubs of ice cream, because it looks like only chocolate, vanilla and strawberry are used. GO NEAPOLITAN! 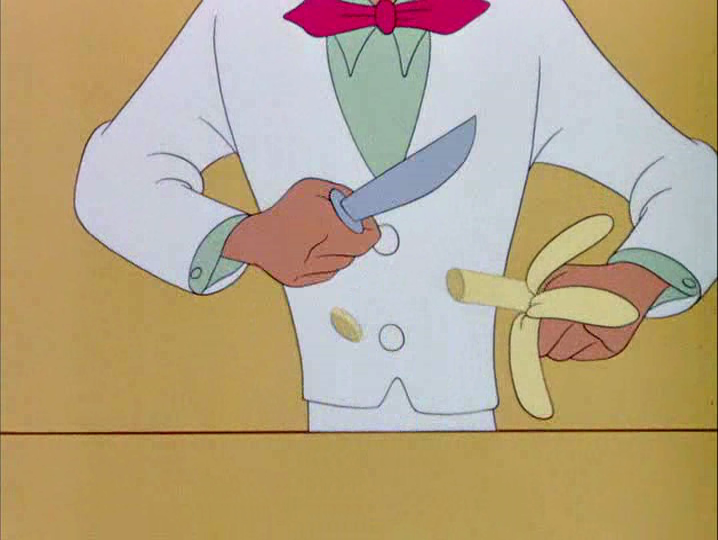 Right after the kids have delicious ice cream, the “bartender” starts to make a strange sandwich. He puts on a green paste and a whole fish. I didn’t bother going into detail with the fish cook. I used the same method as I did in the Pinocchio post. So see there for how to cook the fish. Using a sharp knife, cut the avocados in half, working around the pit. Twist avocados to separate the halves. Spoon out the pit and scoop out the avocado flesh into a resealable plastic storage bag. Add lemon juice and salt, seal bag, and mash the avocado with your hands until mixture is combined and spreadable. 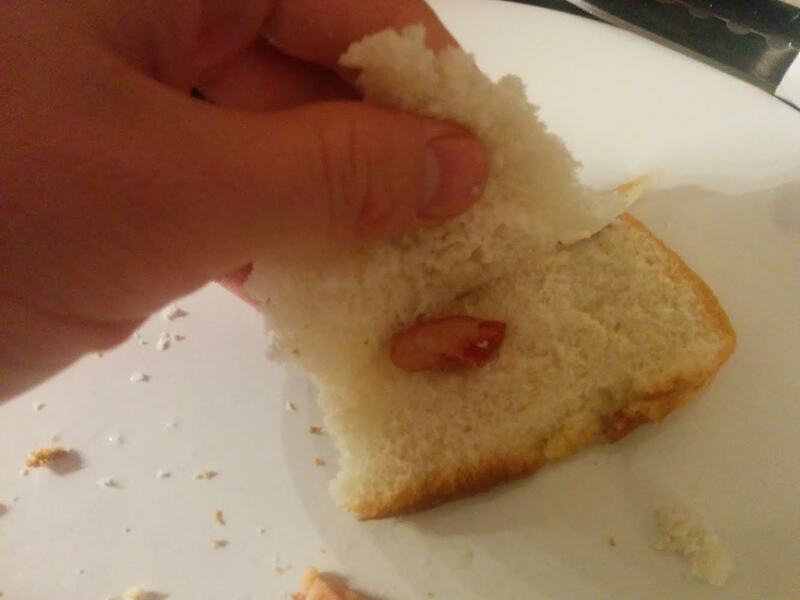 Cut the tip off one corner of plastic bag and pipe mixture onto bread. 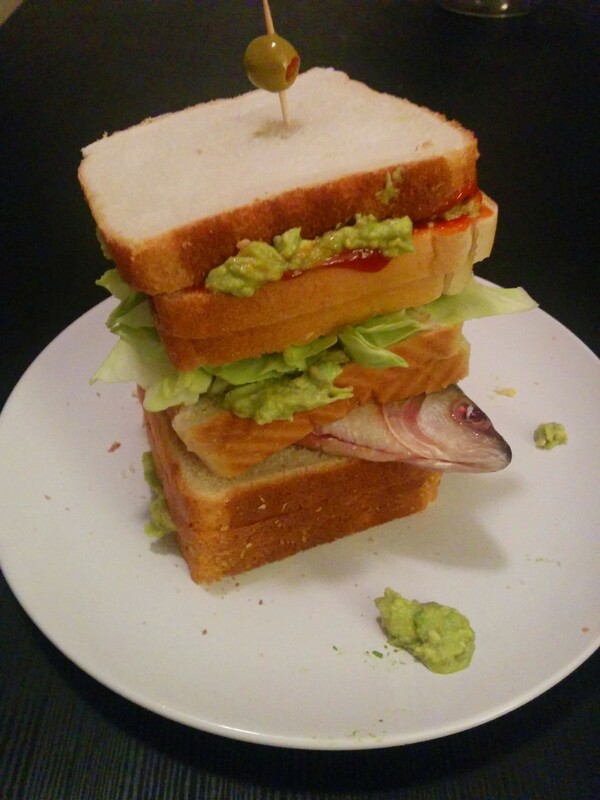 Stack pieces of bread on top of one another with lettuce, spread and/or ketchup. Top with green olive for decor. Now onto Fun and Fancy Free! 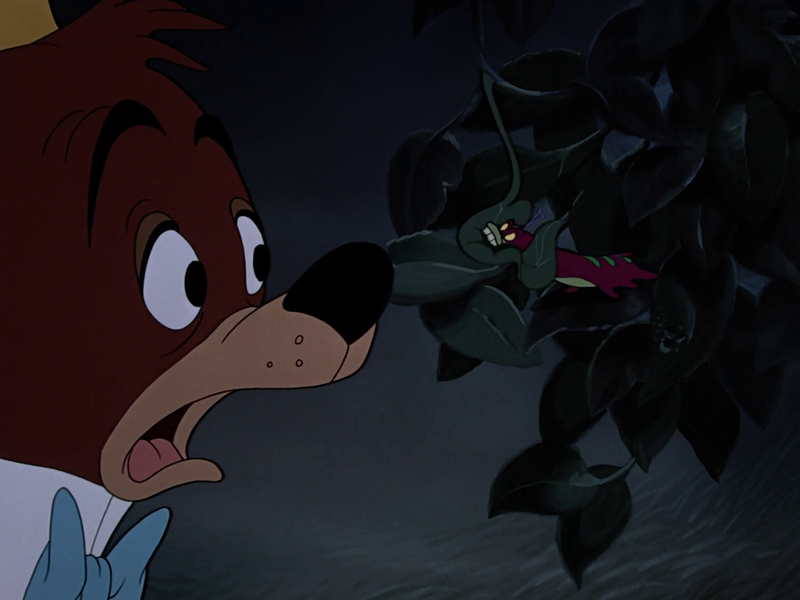 The first segment is all about Bongo the Bear, however, no food is shown in it, besides a caterpillar chomping on a leaf…and I didn’t want to eat any more plants after Bambi. 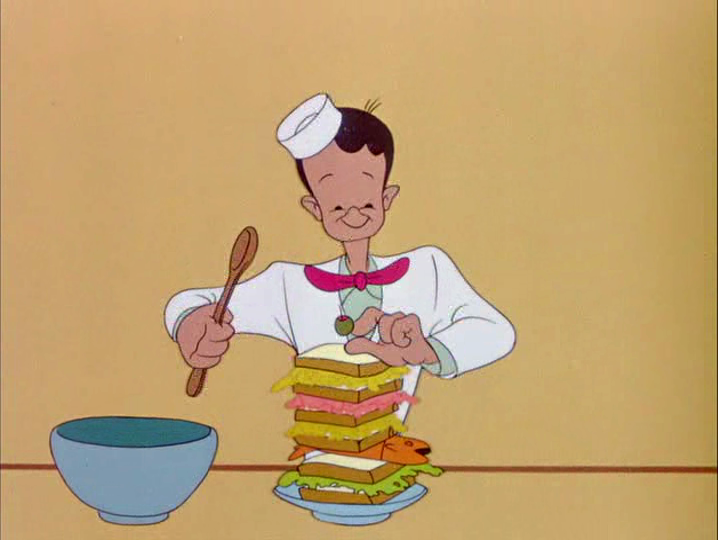 In the second section, Jiminy Cricket jumps into a live-action house where a little girl, Luana is having a birthday party with her strange adult friend and his two ventriloquist dummies. It was actually pretty funny. They made some great puns. I’m all about puns. Anyway, that lucky little girl had two cakes at her party. 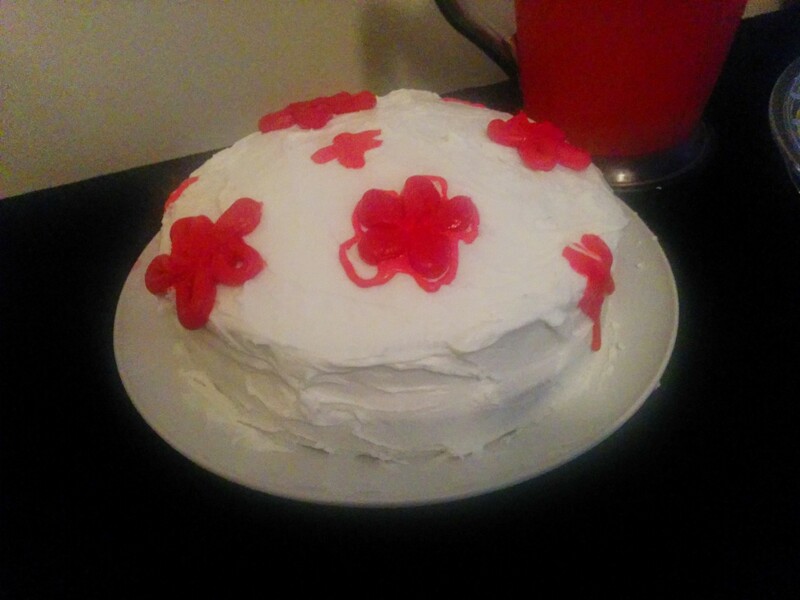 The first one shown is a nice white cake with pink flowers on it. We couldn’t find any pink frosting at the store, so we settled for red in this recipe. Coat two 9″pans with shortening and flour. In mixing bowl combine all ingredients until moistened, then beat with mixer on medium speed for 2 minutes. Bake at 350 for 29-33 minutes. Toothpick should come out clean when inserted into cake. Cool 10-15 minutes before removing from pan. Frost bottom layer first, then put the second cake on top and frost over. 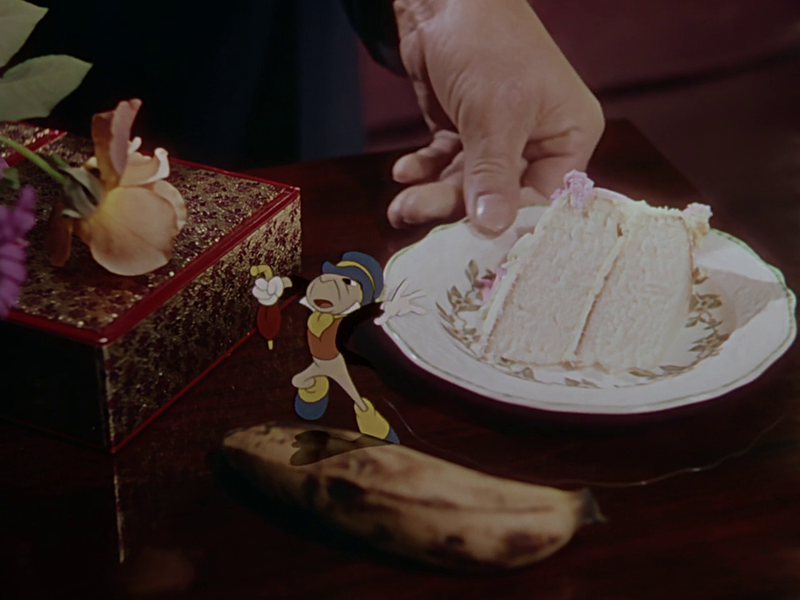 Jiminy, that lucky cricket, start scarfing down an entire human-sized chocolate cake slice and the crazy adult friend is telling the Mickey and the Beanstalk story. 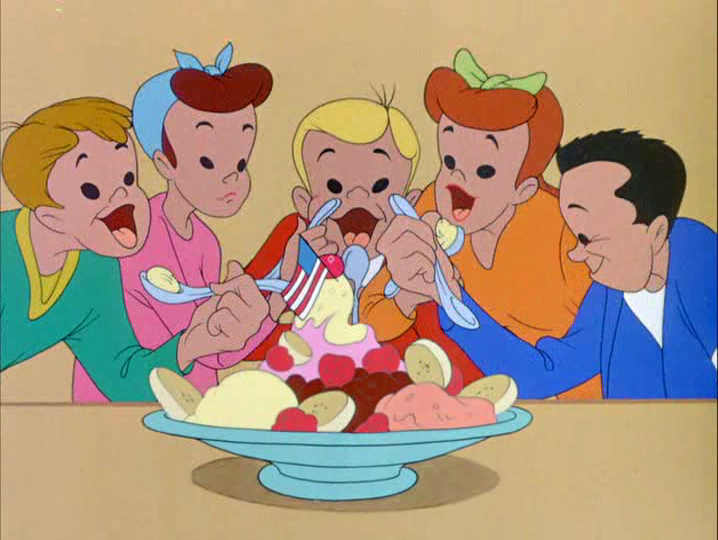 Even though they had some good desserts at Luana’s house, the real food doesn’t come into play until Mickey and friends get up to the giants house. This is probably the most depressing meal I’ve made. 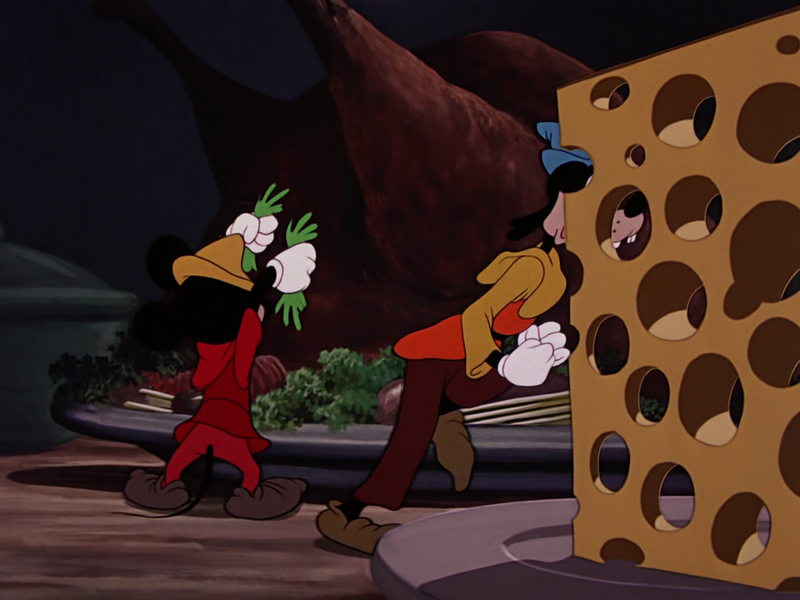 Poor Mickey, Donald and Goofy. 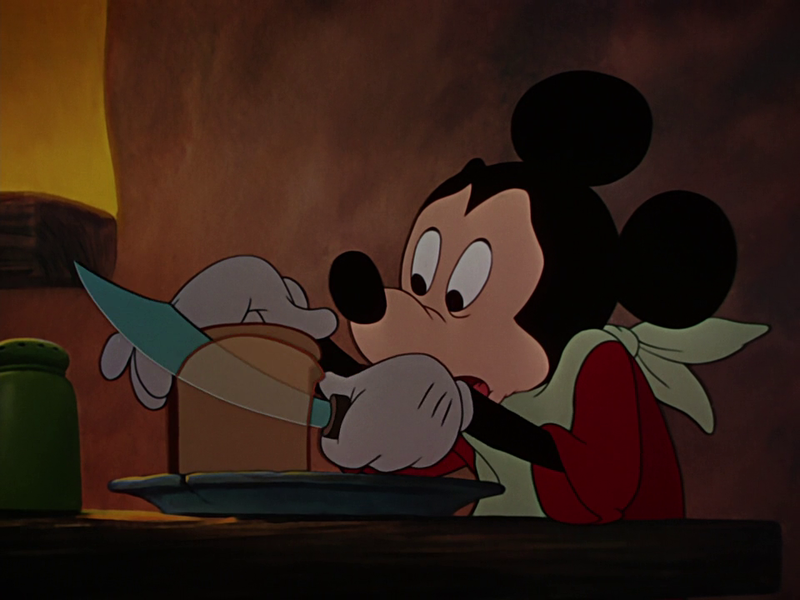 Mickey pulls out a slice of bread and cuts paper thin slices. Which is insanely hard to do, I tried. I need one of those Japanese sushi knives. 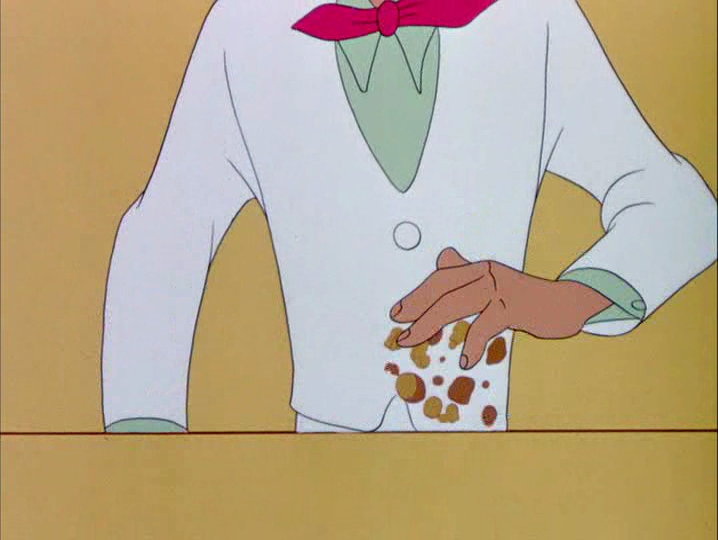 He then pulls out a single bean and cuts that into thirds. The gang puts the bean into their paper bread slice and has the most tear-jerking sandwich of all time. 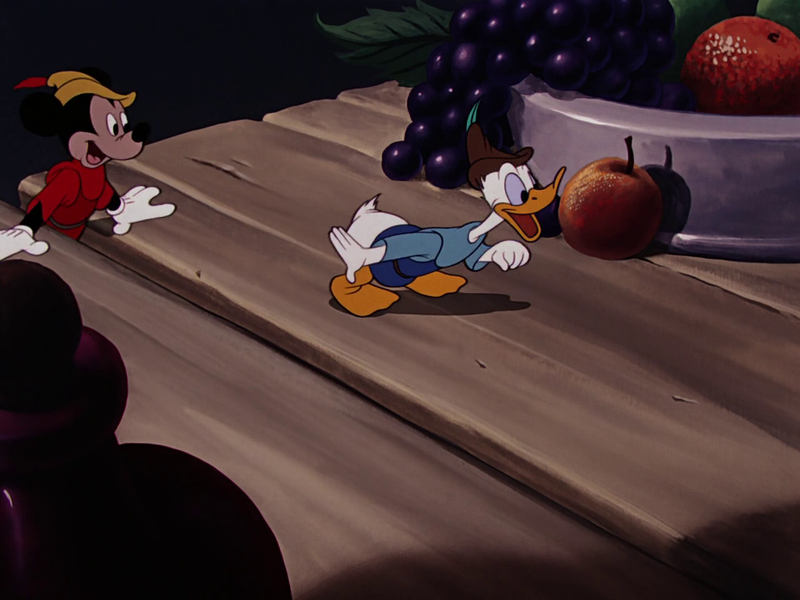 Luckily, fortune rests upon Mickey, Donald, and Goofy when they wander into the giant’s castle and find all of his food. I’ll just post screenshots of all of food that didn’t require recipes here. Jello is the only non-fresh food in that list of pictures, but it is so easy to make from a box, I didn’t want to bother with the recipe. 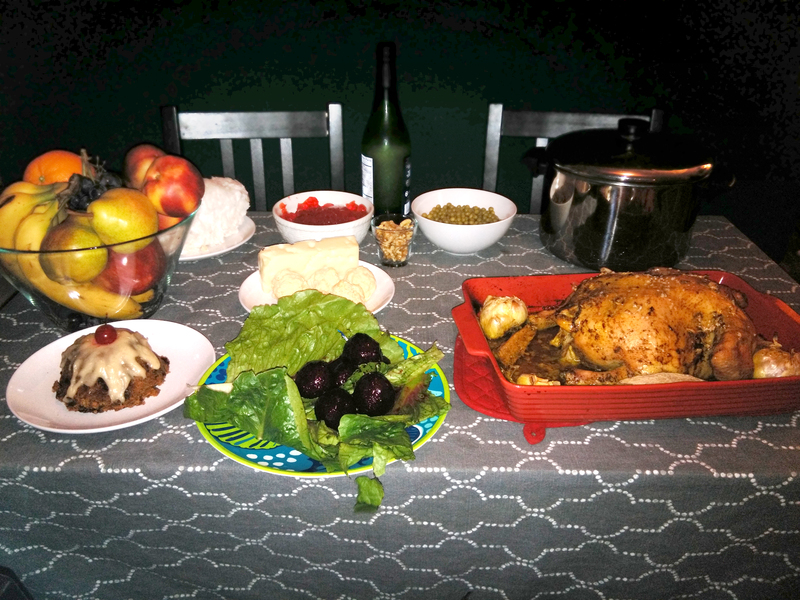 Anyway, one of the center pieces on the table is a huge chicken. 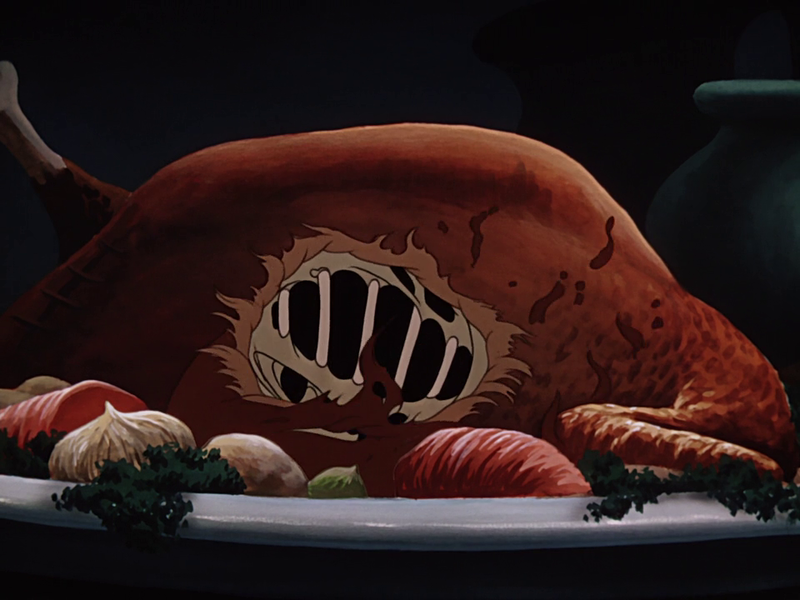 I looked into a medieval-style of cooking the chicken, because the giant lives in a castle, just like in the medieval times. The recipe I went off of calls for saffron. I had no idea of how crazy expensive that was. $10 for a little pinch of it! So I found out that Turmeric is a good substitute, so I used that. Preheat the oven to 230C/450F/Gas 8. Soak the saffron or tumeric in a little of the wine. Rub the chicken all over with the pepper and cinnamon and place the chicken in an ovenproof dish. Cut the tops off the garlic bulbs so you can see the cloves and arrange them around the chicken with the ginger. Pour a little olive oil into the garlic bulbs and pour the saffron and remaining wine around the chicken. 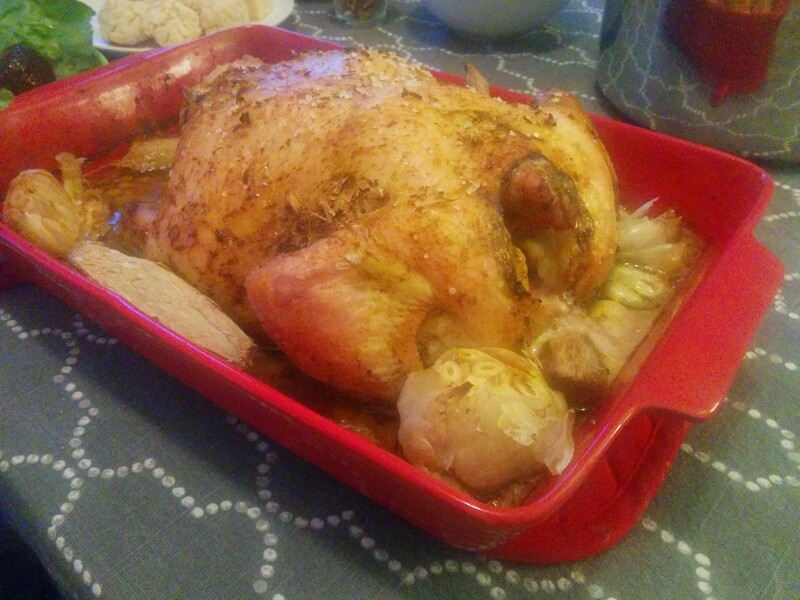 Season the chicken with salt and place in the oven. Cook for another 40 minutes, partly covered with tinfoil, until the juices run clear and the chicken is cooked through. Baste the chicken and garlic regularly during cooking. The coconut cake is kinda in the background, and I’m not sure if it is really coconut cake, look at the picture and tell me what you think. 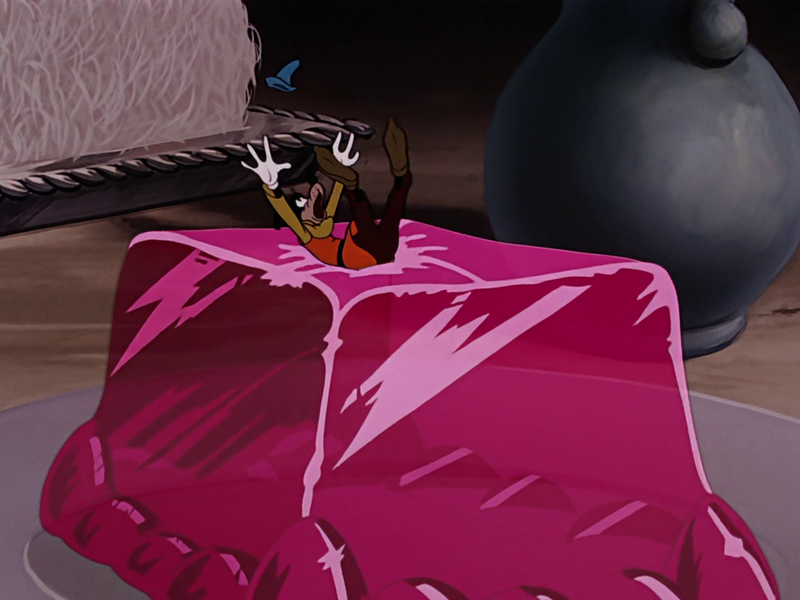 See, behind Goofy flopping around on the jello? Anyway, I’m glad I decided to go with coconut cake, because it was delicious! 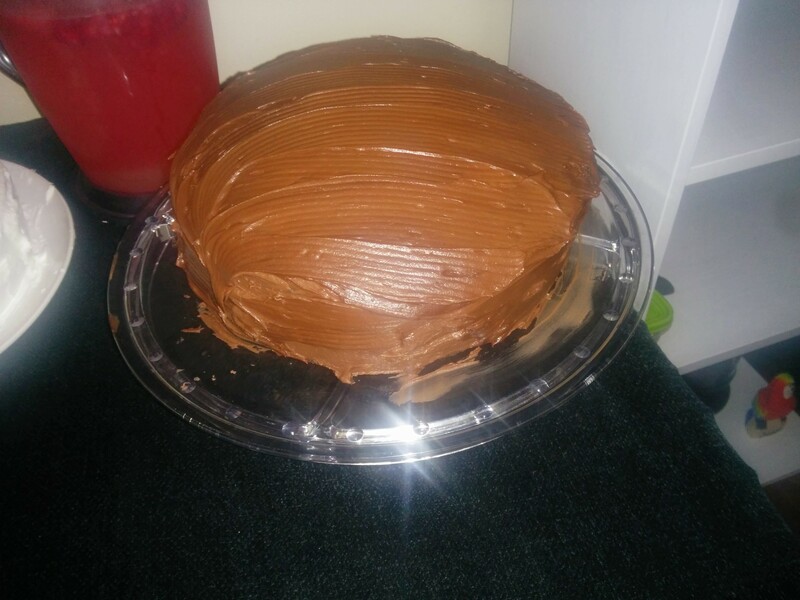 Lightly oil 13×9 inch cake pan. Line the bottom of pan with parchment paper. Oil the parchment paper and then flour the pan. Set aside.Place the flour, baking powder and salt into a large mixing bowl and whisk to combine. Place the butter into the bowl of a stand mixer and using the paddle attachment, cream on medium speed until fluffy, approximately 1 minute. Decrease the speed to low and gradually add the sugar slowly over 1 to 2 minutes. Once all of the sugar has been added, stop the mixer and scrape down the sides. Turn the mixer back on to medium speed and continue creaming until the mixture noticeably lightens in texture and increases slightly in volume, approximately 2 to 3 minutes. Stir in the coconut extract. In a separate bowl, whisk the egg whites until they form stiff peaks. Fold the egg whites into the batter, just until combined. Divide the batter evenly between the pans and bang the pans on the counter top several times to remove any air and to distribute the batter evenly in the pan. Bake for 40 minutes or until the cake is light golden in color and reaches an internal temperature of 200 degrees F.
Cool the cake in the pans for 10 minutes then remove and transfer to a cooling rack. Once the cakes have cooled completely cut across the equator of each to form 4 layers. Place the 1/3 cup coconut water into a small spritz bottle and spray evenly onto the cut side of the 4 layers. If you do not have a spritz bottle you may brush the coconut water on with a silicone pastry brush. Allow to sit while preparing the frosting. Bring 1 quart of water to a boil in a 4-quart saucepan over high heat. Decrease the heat to medium to maintain a steady simmer. In the meantime, place the egg whites, sugar, coconut water, cream of tartar and salt into a medium size-mixing bowl. Place the bowl over the simmering water and immediately begin beating with an electric hand mixer set to low speed. Beat for 1 minute and then increase the speed to high and continue to beat for 5 minutes. Remove from the heat and beat in the coconut and vanilla extracts for 1 minute. Allow the frosting to sit for 5 minutes before using. 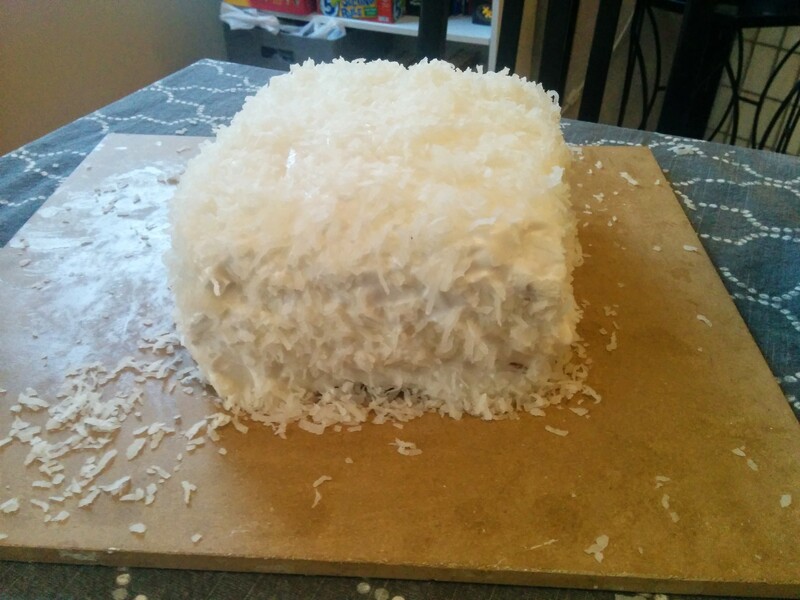 Frost the top and sides of the cake and sprinkle with the shredded coconut. 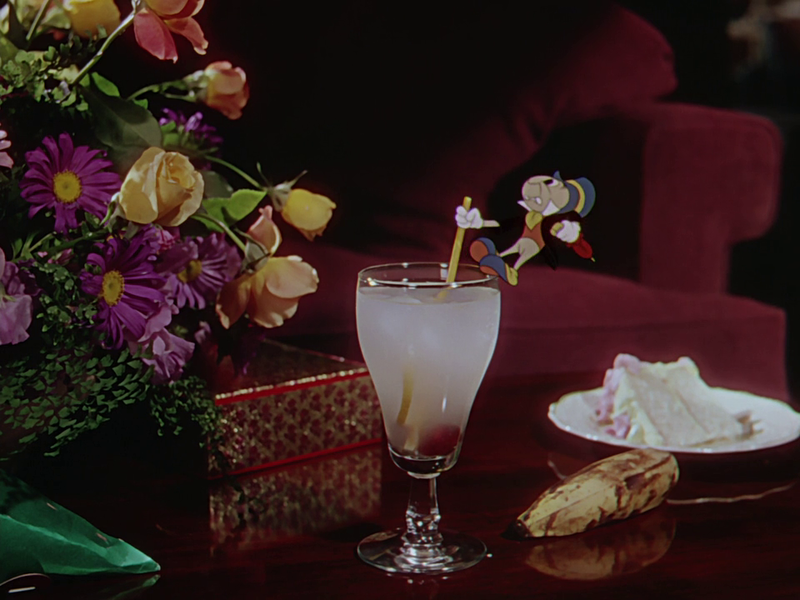 Right before we come to the end of the Mickey and the Beanstalk story, it cuts back to the live-action scene and we see Jiminy stealing more food, this time some lemonade with raspberries in it. 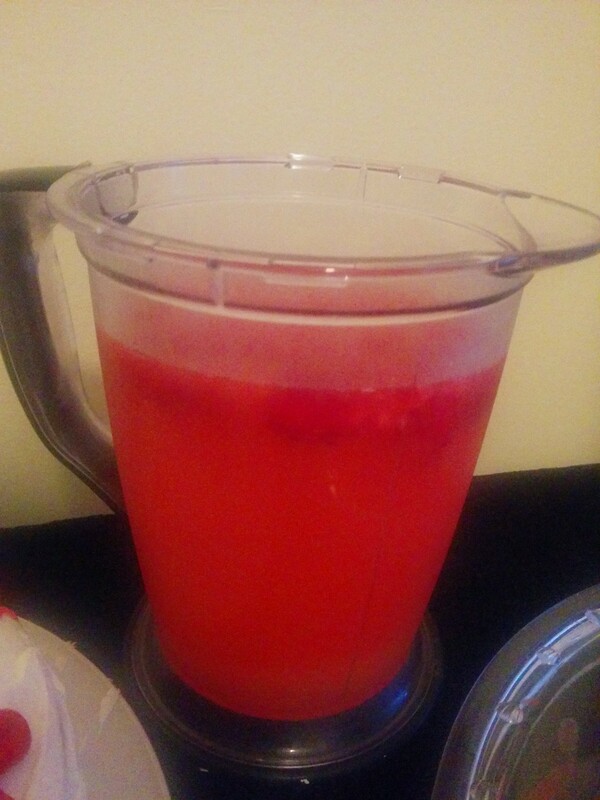 I kinda went a step beyond just putting a couple raspberries into lemonade and made full on raspberry lemonade. It was a good decision too. Mix the lemon juice into the water. I had a huge debate with people about what exactly this food was. Look at the mound with the cherry on top. I had seen a recipe with a picture that looked like that mound before. I think it was in one of my mom’s old cookbooks. My first thought was a chocolate-lava cake, but that didn’t feel right. I asked a bunch of people and finally, my mother-in-law came up with the answer. Plum Pudding. 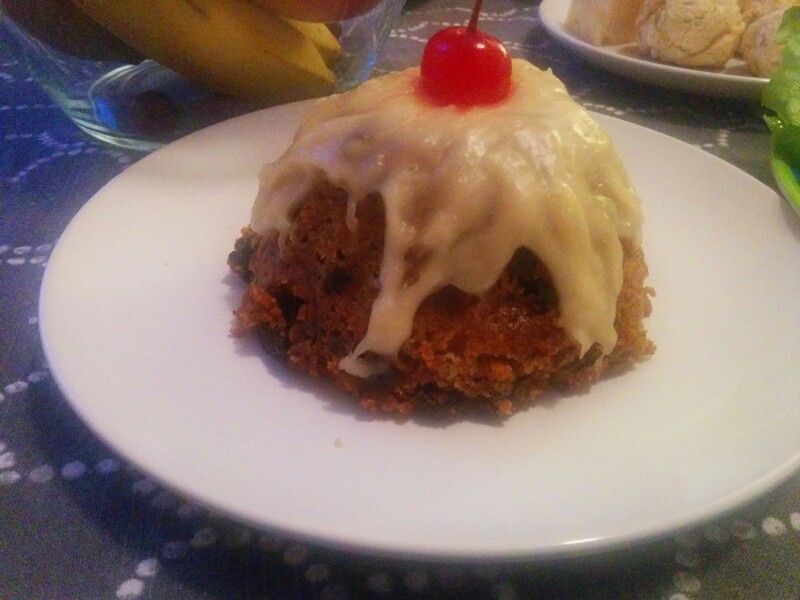 I had never had plum pudding, so I was excited to try it. This was another debatable food from the same screenshot. Behind the plum pudding are some pink ovals on greens. One of my facebook friends figured this one out. Candied beets. 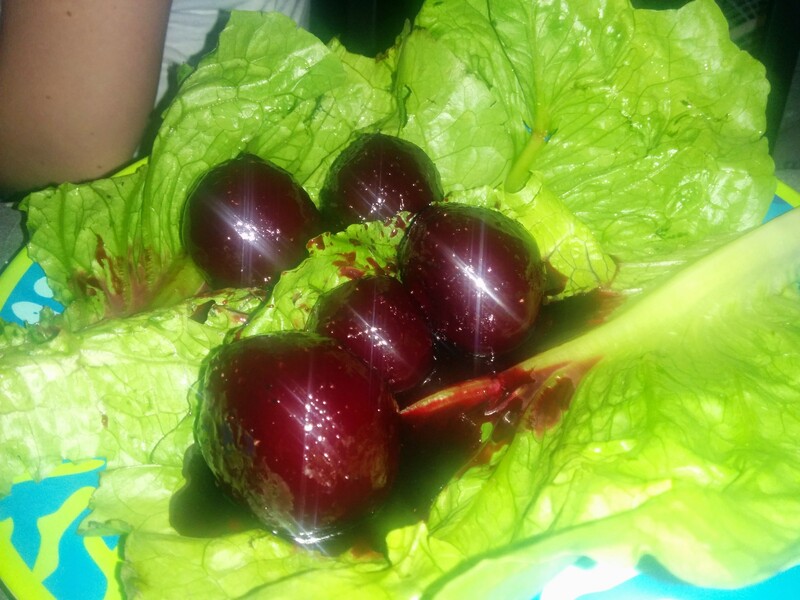 So naturally, I let the beet drop! Combine brown sugar, orange juice, butter, salt and pepper in a large nonstick skillet. Cook over medium heat until the sugar and butter are melted and starting to bubble. Stir in beets and cook until most of the liquid has evaporated and the beets are coated with glaze, 8-10 minutes. 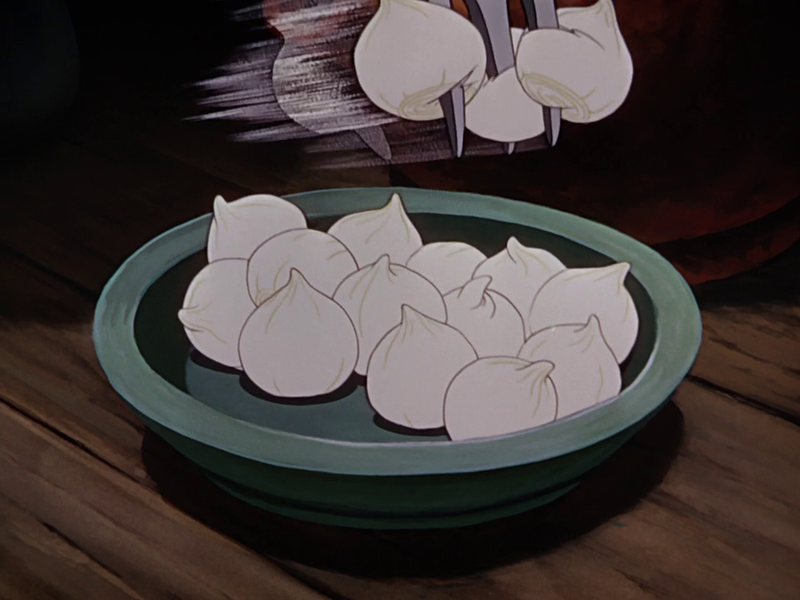 When the giant is gathering up food to eat, he grabs some, what I assume are, dumplings. 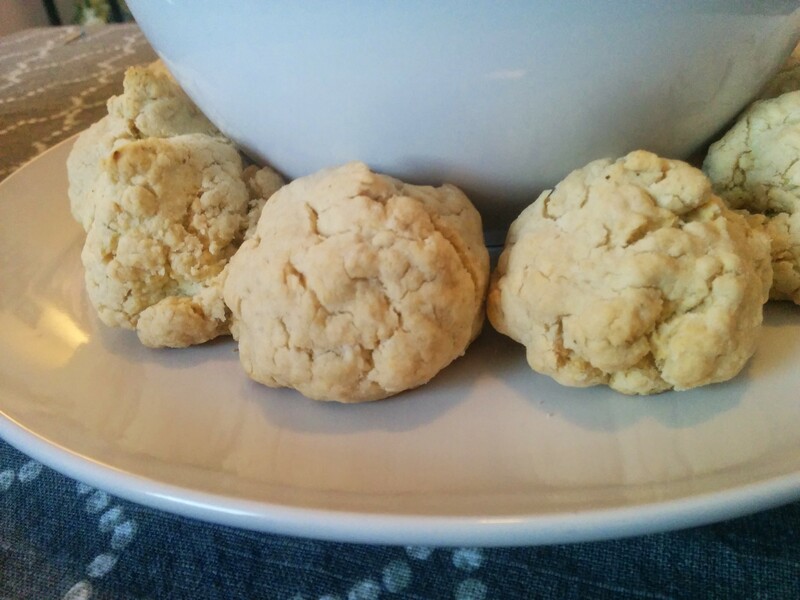 When I tried making them, I didn’t let them cook with moisture, so they turned out really dry, but the flavor was really good! Put flour into mixing bowl. Using a coarse grater, grate cold butter into flour. Using your fingers, gently rub the butter into the flour until it begins to resemble breadcrumbs. Add a little cold water to help it bind into dough. Divide dough into 12 pieces and gently roll each into a round dumpling. We don’t actually get to see this one. Willie the Giant holds a pot to his face and takes a big whiff and says “mmm, chocolate pot-roast.” That seems really strange. 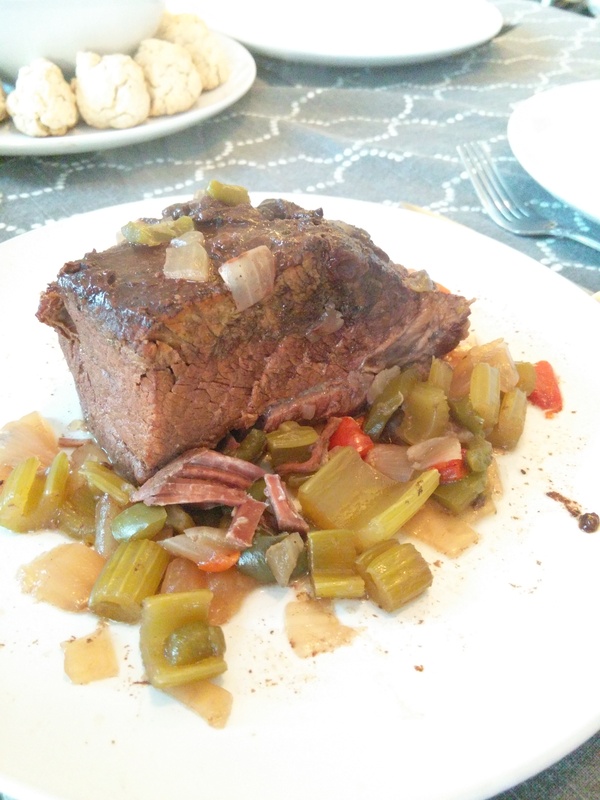 Chocolate on pot-roast? Well I tried making it anyway. And it was delicious. Who would think that chocolate would flavor beef so well. Coarsley chop the vegetables and toss into pot. Pour in the wine and simmer until the liquid is reduced by at least half. Sprinkle the top of the beef with chili powder, paprika, cinnamon, pepper, and salt then broil on a tray until browned. Put in crock pot, lay chocolate on top of roast. Optional: Puree half the vegetables and chicken stock together for a gravy. 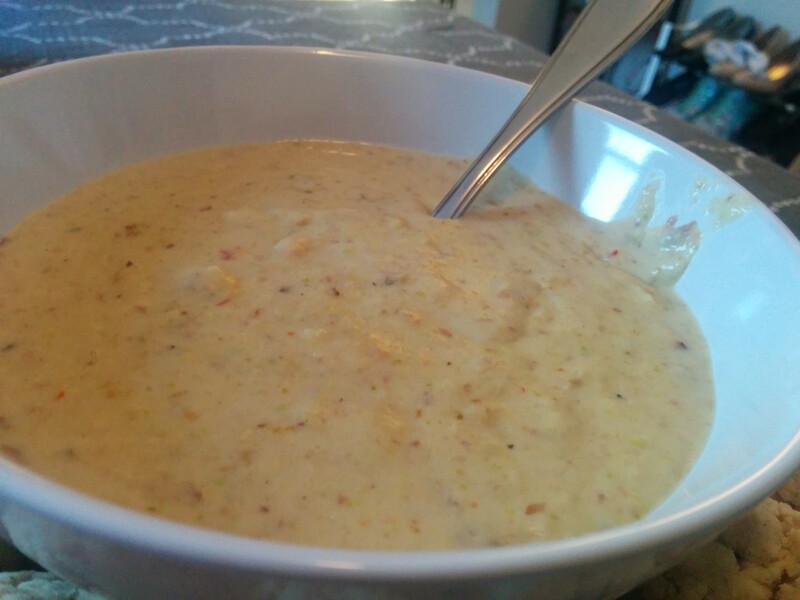 The pistachio gravy I made didn’t turn out very green…just slightly green-ish, but it still tasted good. Add pistachios and enough olive oil to lightly coat. Cook for about a minute (the pistachios should not change color). 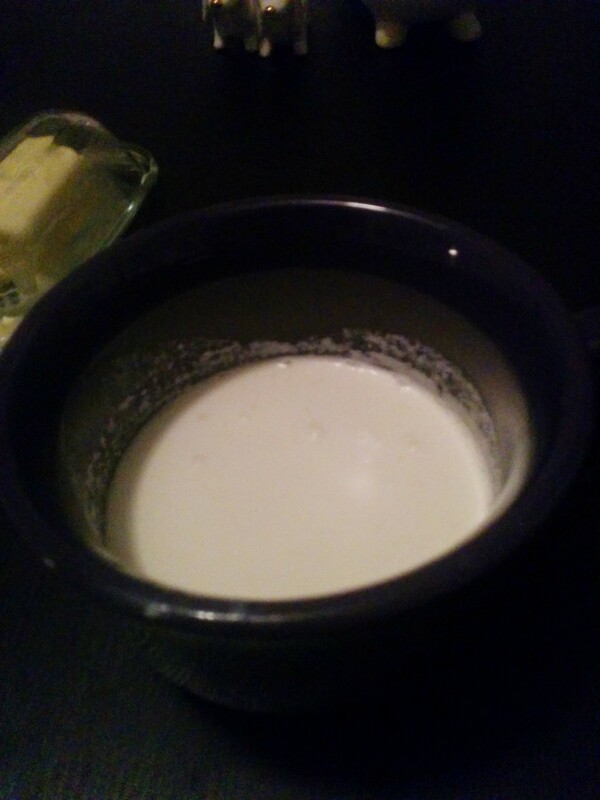 Add cream until heated throughout. Return to stove, add milk and flour. Will it Make You Say “Fe-fi-fo-yum? The Make Mine Music ice cream was good, just as good as ice cream is. Nothing amazingly special. The fish sandwich was an odd combination. 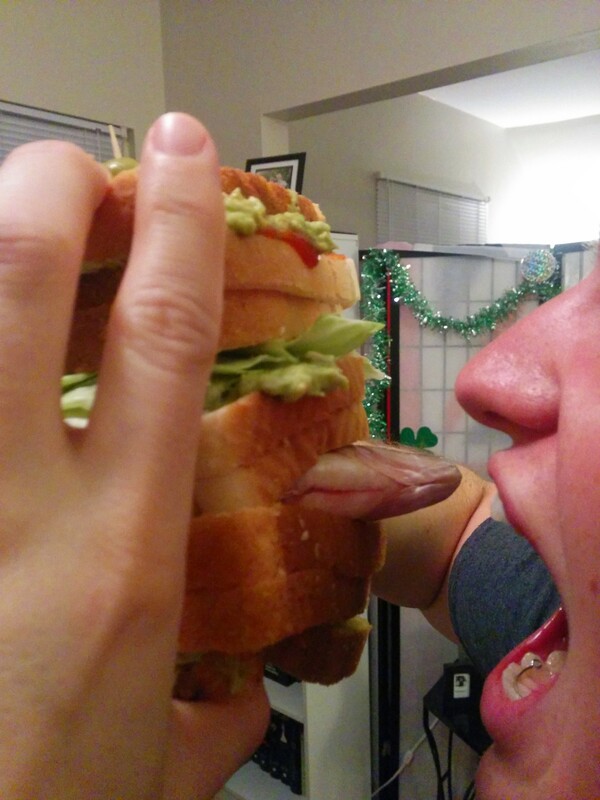 It was hard to eat a boney fish inside of a sandwich. The avocado spread alone was good though. The live-action food from Luana’s house was really good. 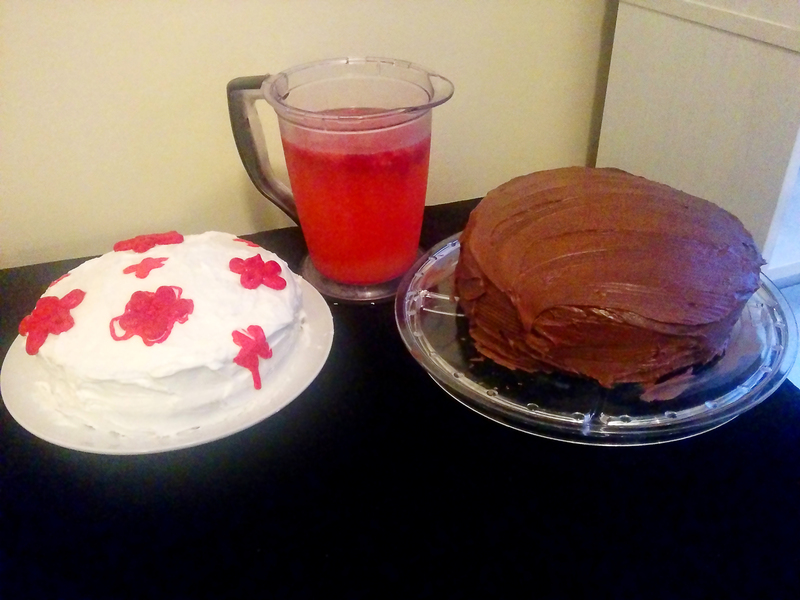 The cakes were tasty, but the raspberry lemonade is the true recipe that took the cake from the cakes. Now onto the giant’s feast. 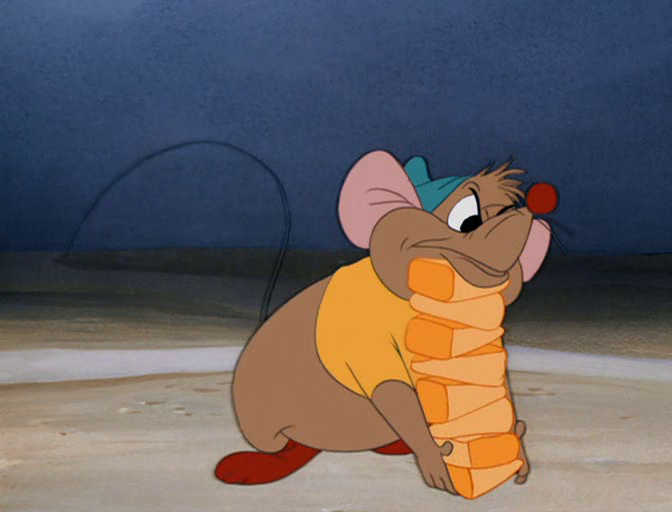 Wow, that was a LOT of food. The chicken was the real winner here. We had some guests over to help us eat the food, and they all raved about the chicken. Although everything was really good. I was impressed with the plum pudding, having never tasted it before. The chocolate pot roast was good and even better with the green gravy. It is kinda crazy how the bitterness of the chocolate and the saltiness of the potroast and pistachios really blended well. And I can’t forget about the coconut cake. That was to die for. My wife didn’t like it because she doesn’t like coconut, but everyone else that tried it loved it.